Join us on the afternoon of Saturday September 15th to help celebrate thirty wonderful years of Hopscotch Children’s Nurseries in Sussex. 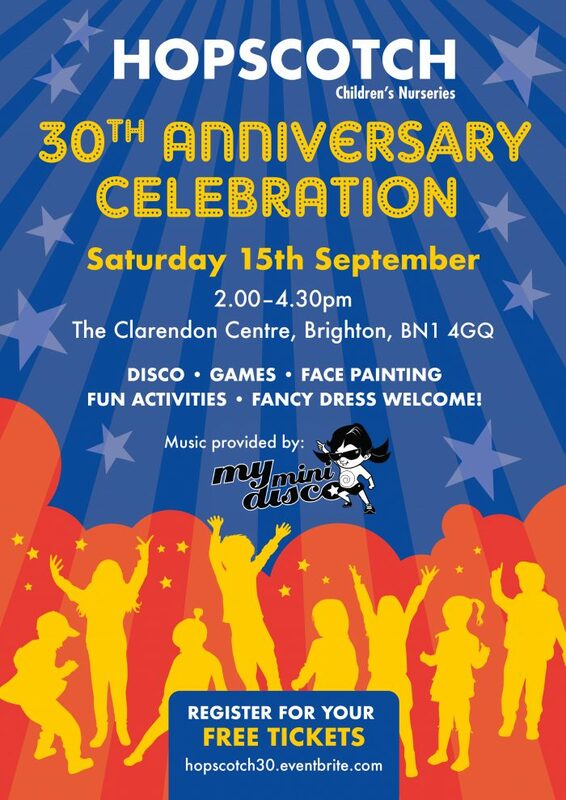 We will be holding a fun-filled free event for our parents and children at the Clarendon Centre in central Brighton (BN1 4GQ) with music and games provided by Brighton’s very own My Mini Disco, who have frequently played music festivals across the UK as well as regularly filling up Brighton Festival’s Spiegeltent and Komedia venues. Tickets are available on a first come, first served basis and are limited so we recommend you sign up early to avoid disappointment! !